First – Avatar got robbed, but that’s not really a big surprise because Science Fiction doesn’t get a whole lot of respect when it comes to the big awards. Quick! Someone put a sock in her mouth! Second – What’s up with Elinor Burkett? 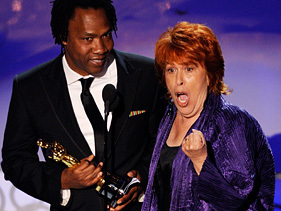 She stormed the stage like she was taking the beach at Normandy and shouted over Roger Ross Williams in the middle of his acceptance speech for winning best short documentary for Music by Prudence. I honestly thought she was some nut job who got past security and jumped on stage. Turns out she’s a producer on the film. My heart goes out to Williams. Not only did his Oscar moment get ruined, but he had to work with that whacko while making his film. Someone get him a Xanax and a Purple Heart. Third – I saw Hurt Locker. It was a good movie. Was it the best picture of the year? In a word – no.